writing | Where is Here? I really didn’t want Where is Here? to turn into a Bunch of Links About That Book I Wrote, though that seems to be where it’s headed these days. Not forever, I hope. I went to the Bicentennial “celebrations” for the Battle of Fort York last weekend, and I had a lot of thoughts, but they’ve mostly bypassed the blogging stage and leapt straight into the chapter about The War of 1812. In both cases I feel lucky that the readers approached the book so thoughtfully, and with such generosity. The Paradise Engine. At last. 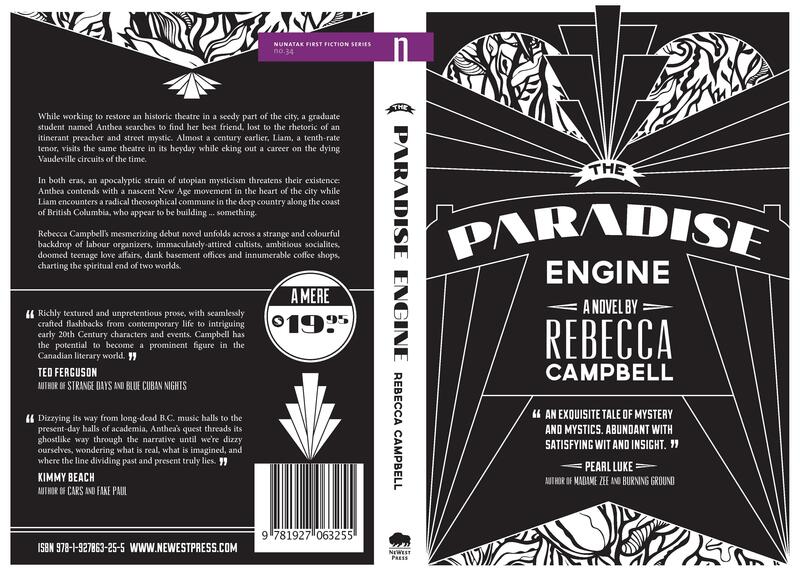 The Paradise Engine by Rebecca Campbell. Forthcoming from NeWest Press May 2013. So. Nearly four months away from this blog, which makes me sad, because I really like blogging. I spent most of the winter swamped in the innumerable, seemingly-unfinish-able tasks that dictate how and where I spend my time. That means either marking, or writing academic stuff. In happy news, I’ll be presenting a paper on Insurgency & Commemoration at Batoche for CACLALS this spring, at UVic. I haven’t presented a paper since 2011, so it’s about time. I’m teaching an extra section of composition, too, for January – April, which means I have 70 students instead of the 30-something I had in the autumn. For the most part this is good news (for four months we’ve cracked the poverty line!) but it means I have no time. And so much to do. I try not to do the infernal mathematics: 70 students x 12ish assignments each = what was I thinking. Of course, there are bright things, too, and pleasant news. One of them is that my novel is coming out in May. It has a cover! It’s very very pretty. I feel so lucky that the people at NeWest— editors, designers, marketers, managers– understand what I was trying to do, and have designed something that reflects & expands on the story. I’ve been thinking a lot about collaboration for the last couple of weeks, as I realize how many people have contributed to turning The Paradise Engine from a secret word document I kept squirreled away on my harddrive, to an actual, real book. That’s pretty exciting.